Quail Valley provides six well-maintained and lighted courts for members to reserve in 1.5 hour increments seven days a week, 7 am to 8:30 pm (last available time slot). Please note: Members can only reserve one court at a time. Plan your tennis date by reserving a court through our online court reservation system. Two of the courts are painted appropriately for 10 & under tennis matches. Quail Valley is a member of the US Tennis Association. All QVSR members are welcome to the QV Tennis Socials (currently Friday Evenings at 6:30pm). Email sbudzi@yahoo.com to be included on the email list for details. 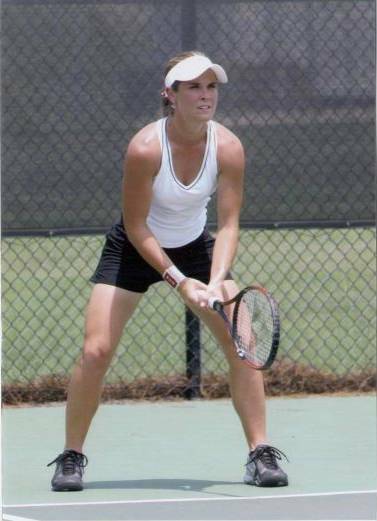 Dainyell has a combined 28 years of teaching and competing with tennis and fitness. She is a USPTA Elite Professional, PTR Instructor Certified, NASM (National Academy of Sports Medicine) Certified Personal Trainer, and many more credentials. She played Division 1 College Tennis, Satellite Tour and was traveling coach for nationally ranked players in NC and Fl. She looks forward to passing on her years of hard work and experience to you. Judit is a PTR certified tennis pro who was a top 5 junior player in Hungary prior to arriving in the United States. She played #1 singles and doubles for Winthrop University and received three Big south All-Conference Awards in singles and two in doubles. Judit also lead Winthrop to its first and second NCAA tournament. After graduation, Judit earned the #2 open adult ranking in the Southern Region. In July 2008 she was recognized as one of the best athletes of the conference’s 25 years.